Connect is a cellular data connection service for communication with remote devices over a private network. It is typically used to connect T-Stars to Enterprise Servers. Connect provides a secure and reliable network for enterprise solutions that deploy and monitor remote locations or as a NOC - Network Operation Center. Connect is a virtual private network that is usable anywhere cellular service is available. Backed by reliable Wireless Carriers for service, access, and data transfers, the Connect Private Network serves as a WAN - Wide Area Network - in an enterprise solution. Connect allows communication with any device at any time to retrieve data or results or write updates to the remote device and provides easy, rapid deployment and networking of devices without needing to rely on individual site IT infrastructure. The Connect Private Network in an enterprise solution allows internal IT systems at sites to be completely isolated. Connect is inaccessible from the public internet space. 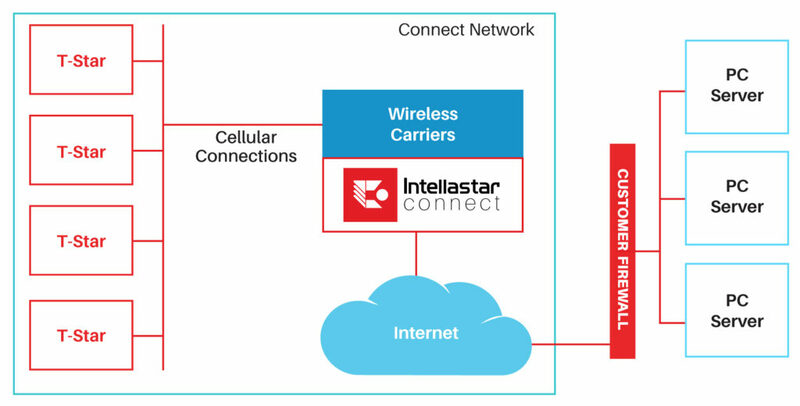 Devices using the Connect service will only communicate across a private APN with the wireless carrier partners, resulting in a controlled, secure and reliable network. The connect network is accessed via a secured VPN, using AES 256 bit encryption for protecting the data, and alleviates many of today’s security threats by simply not being visible from the public internet. T-Star’s or any other 3G or 4G device may be used with a Connect Private Network. Various Data Plans are available in a variety of sizes to fit different solution needs in a cost effective manner.